The People's Great Hural consisted of 370 members of the MPRP elected from each election district (the total population was divided into units of 4,000 people for the elections). It should be noted that the voters confirmed rather than elected the candidate chosen by MPRP for each election district, since they did not have multiple options to choose from and the candidates were to be accepted unanimously. The People's Great Hural, the state's highest legislative body and government organ, ruled the state, established all executive state organizations, and was responsible for ratifying and amending the Constitution and other laws. 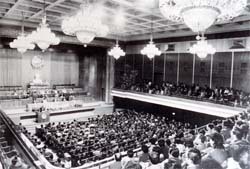 "...voters confirmed rather than elected the candidate chosen by MPRP for each election district..."
The Ih Hural (Parliament) in the Communist era, courtesy of the National Museum of Mongolian History. The People's Great Hural also appointed the provincial and district hural members, who were responsible for implementing the laws and decrees of the central government. The provincial and district hurals were in charge of all local political, economic, and social organizations and activities. The executive committees of the provincial and district hurals were elected by the provincial and district hurals to effectively manage the rapidly increasing urban and rural population. These committees served as bureaucratic organizations for the district Hurals, and reported both to the Council of the Ministries and the local Hurals for their activities.